- Set of eight 1/4-24 screws to hold the blade irons to the hub. Probably 3/4” long. There used to be a huge surplus fastener house in Chicago called Industtial Supply. They had everything. I once bought a ceiling fan friend 1000 1/4-24 X 3/4 Slotted Fillister Head Machine Screws. I can’t find them now. Used to be you could buy longer 1/4-24 screws, cut them off and thread them. That’s when threads were cut. Now threads are rolled. The threads are larger than the unthreaded part. You can put in a Perma Thread for 1/4-20 threads. Or buy a lightly larger metric screw, and cut the threads. There are some on EBay but very expensive. It’s funny. I need to get some finials (nut on top of a table lamp that holds the shade on). It uses 1/4-27. There must be an odd history here, maybe dating back to gas lights. 1/4-27 is an electrical thread. Most lamp part suppliers have those. For some reason, Indian Motorcycles used fasteners with 1/4-24 threads. So, if you can find someone who works on Indian Motorcycles they will probably have the die to cut the threads. Second you can put 1/4-20 screws in the holes. They will work. Lastly you can insert Perma Threads. Steve Cunningham wrote: For some reason, Indian Motorcycles used fasteners with 1/4-24 threads. So, if you can find someone who works on Indian Motorcycles they will probably have the die to cut the threads. Thanks. Harley used them, too, but not in a length I can use. Darryl Hudson can make them. M6x1 is very close. It’s like a 1/4-25. 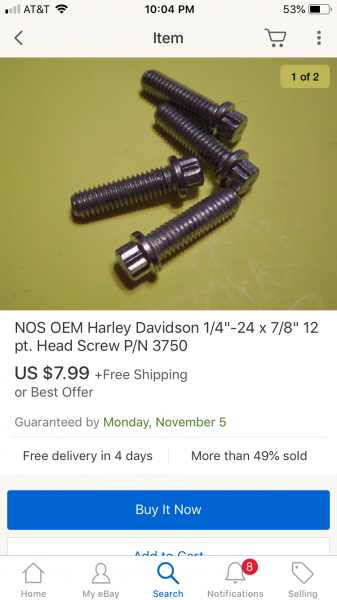 Ain't cheap at $4.00 per screw, but the panhead 7/8" long screw is probably just what you need. Thanks. Looks good. Duesenberg screws. Bought them for a Westy Deluxe. They didn't really fit. Ended up with others. Memory fart, but I can check emails if you want. You might want to keep an eye out at the old tap and die sets at the flee mkts and sales and you may find one that has those taps and dies. I have a set but don't know what all is covered right at the minute. This would be before the number sizes 4 40 10 24 etc. I ended up buying them off eBay. 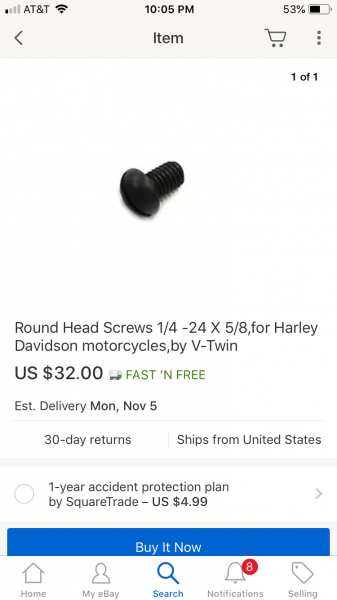 Harley Davidson used these screws and the restorers sell them. Fit fine. Page processed in 0.2277 seconds (34% database + 66% PHP). 35 queries executed.